Congratulations. We offer Villa Wedding packages & planning. Enjoy browsing our wedding villas & find out how we work below. With its expansive open spaces, whitewashed walls, natural light and elegant design, Villa Beyond invites true relaxation. This luxury 5 bedroom villa is a holiday home for the discerning world traveler that cleverly brings together the traditional with the contemporary in stunning Kamala. 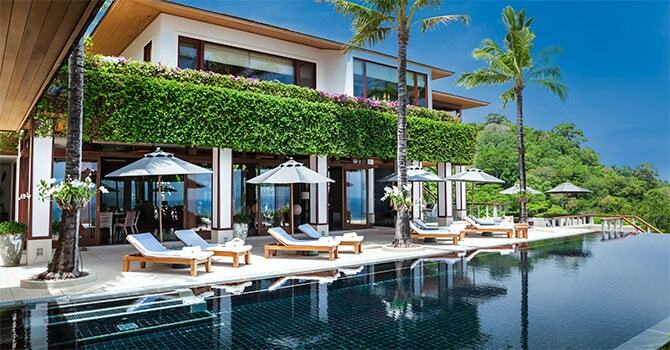 A dazzling 6-bedroom 1,300 sqm estate, this villa stands out as one of the brightest gems on Phuket’s scenic west coast, with style & comfort inside and out. A unique luxury haven, this 5 bedroom villa is carefully crafted to suit its spectacular surroundings to create an overall atmosphere of modern tropical minimalism in Kamala. This 6-floor hillside villa offers panoramic views of the Andaman Sea, Surin Beach, along with the lush mountains and valleys inland. Planning a wedding is one of the most exciting and special times in your life, as you put together a wonderful celebration of the love you and your partner share, and get ready to begin your forever. A wedding in Phuket is a stunning way to begin your new life together as a married couple. The gorgeous sea and mountains make a beautiful backdrop for your union, while warm and experienced staff are on hand to ensure everything runs smoothly and that all you need to do is enjoy every wonderful moment. We are so thrilled that you are considering a Phuket wedding – it's a great choice. To discuss creating your Phuket villa wedding package, no obligation, feel free to CONTACT US. 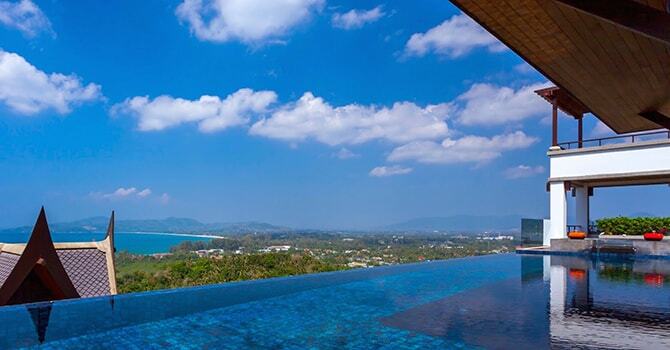 Perhaps you have already begun looking at options for Phuket wedding packages. 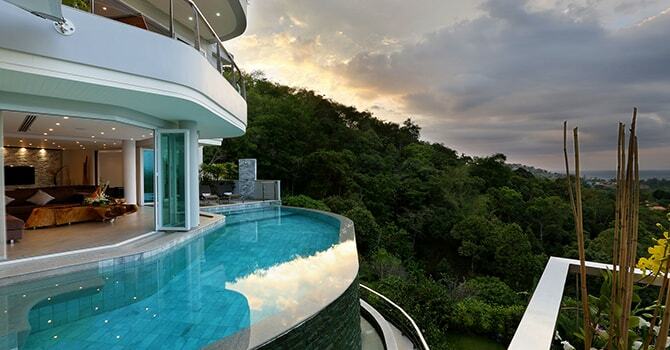 If so, you may be asking yourself whether you should consider a Phuket villa or hotel for your wedding. There are many reasons why a Phuket villa may be preferable for your special day. Luxury villas are not only elegant and modern, but they each offer their own individual charm and décor - giving you so many options to find the perfect space that reflects your vision for your wedding day. With a Phuket wedding villa, there are no cookie cutter, one-size-fits-all package repeated over and over. Instead, your day is tailored exactly to reflect you as a couple – your tastes, preferences and style. There are so many villas to choose from – from rustic homes with traditional Thai accents, to sleek contemporary structures. A villa allows you to choose the perfect option for you as a couple. As all of our villas are hand-selected and inspected, you can have the utmost confidence that they will be perfect. Villas are also more private, allowing for just you and your chosen guests to be present as you exchange vows - no unexpected onlookers, just those you love. In addition, villas are fully staffed with a small team who you will get to know personally and feel entirely comfortable around. These staff will be on hand to take care of all matters of preparations & planning, so there is nothing for you to worry about. In-house chefs can even cook delectable meals in the comfort and privacy of the villa. There is also a great deal of convenience with a Phuket wedding villa. There’s no need to worry about arranging transport to your wedding night accommodation, simply slip back to the beautifully appointed rooms on-site. There are even villas that will cater for large groups in various standalone pavilions. Choosing the perfect backdrop for your wedding is one of the most important decisions you will make. Luckily, Phuket’s dazzling natural beauty means you are spoiled for choice for the setting of your wedding villa on the beautiful island. Look out over the azure Andaman sea, the sand in your toes - or perhaps say your vows nestled amongst a hilltop tropical garden. There are even more unique options, such as getting married aboard a luxury yacht or even beneath the ocean! 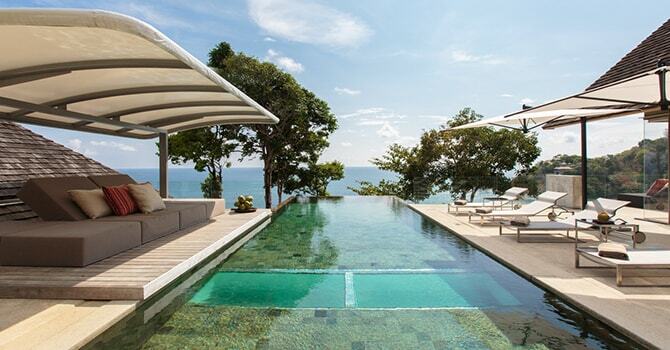 If you as a couple can dream it, chances are there is a luxury Phuket wedding villa that fits the bill. With many different styles of villas, from ultra-sleek and modern to warm traditional offerings, there are many choices available to you. The benefit of our Phuket wedding packages is that they are totally bespoke, so you will have choice over the style and character of your villa as well as the ceremony. One important thing to consider is how many guests you wish to have on your big day. Whether you opt for an intimate elopement with just you and your love, or prefer to be surrounded by all of your friends and family, there is sure to be a villa available that meets your requirements. You may also like to consider whether you would like guests to stay on the grounds of the villa, in separate pavilions, or whether you would prefer the space to remain private for you as a couple. We also recommend choosing a Phuket wedding villa that is fully staffed. At our villas, you will be taken care of by a small but experienced team who are on-hand in the days leading up to the wedding and after. These kind and professional staff ensure that all your needs will be taken care of – so all you need to worry about is enjoying your special day and time with your loved ones. Another consideration is the facilities and services provided by the villa. Not only will these be a part of your special day, but they can also be enjoyed in the lead up to your wedding. For example, a private massage space allows you to have delightful in-villa beauty treatments, while relaxing pool-side with a cocktail in-hand is an ideal way to spend your first few days as a married couple. It’s certainly worth considering what kind of facilities you’d like at your Phuket wedding villa. A brilliant wedding planner is worth their weight in gold, helping guide you through all the decision making that comes with a wedding in order to ensure the end result is exactly what you’d dreamed of. We are delighted to offer a cohesive and holistic service where our Phuket wedding packages also have the benefit of an experienced wedding planner. This planner will be your eyes, ears and feet on the ground, helping liaise between you and suppliers, ensuring the planning process is fun and stress-free. Our Phuket wedding planners intimately know each of our luxury villas, so they can offer advice and guidance from the earliest planning right up until your big day. We will begin with discussing your vision for your day, starting with themes, colour schemes and general inspiration to get a feel for you and your preferences. We will then work with you to source and book suppliers and vendors. You will not have to worry about a thing, our wedding planners delight in helping to book everything that is required, such as photographers, florists, makeup artists, hair stylists and, of course, celebrants. As experienced Phuket wedding planners, we are familiar with all of the best quality vendors on the island, and we can ensure that each and every person involved in your wedding exceeds your expectations. In addition, we can help to ensure that all of the paperwork and legal requirements are sorted out without any hassles or worry. Whether your dream wedding is a small and intimate affair with just you and your love, or a grand occasion for all your friends and family, our Phuket wedding packages can ensure it is everything you’d dreamed of. Our professional team are experienced not only in helping you put together the perfect celebration of your love and union, but also in planning other events. We can therefore draw on this experience to create stunning experiences for you and your guests, either as part of your wedding, or perhaps as part of the wider festivities before or after. Whatever your vision for your Phuket wedding day, we can make it happen. Whether you hope to exchange your "I Do’s” under the water or with traditional Thai customs, we have experienced in tailoring small and large events to perfection. For us, each and every wedding is a unique and joyous occasion, and we appreciate that every couple is different. We listen carefully to you and what you want, in order to plan the ideal events. Another thing that makes Phuket such a perfect backdrop for a wedding is the amazing variety of things to do and see on the island. With a Phuket wedding, not only will your big day be spectacular – but the days around it will be exciting and fun-filled, too. We can help to arrange activities such as catamaran cruises to beautiful, unspoiled Thai islands, and even help you plan some festivities for your Bachelor or Bachelorettes’ Party. Perhaps you wish to have a relaxing massage or a facial before the big day – or a romantic couples’ massage in the days after? Our concierge will be thrilled to arrange it for you. How Much Does a Phuket Wedding Cost? A budget is always an important part of any wedding, and we understand you want to know that you are getting good value from your Phuket wedding package. As our packages are custom made, there is no set price. Factors such as the time of year, size of your wedding party and guest list, and amount of time you wish to spend in Phuket can all be factors that influence the final cost. We can work with you to plan out a dream wedding that is within your budget. 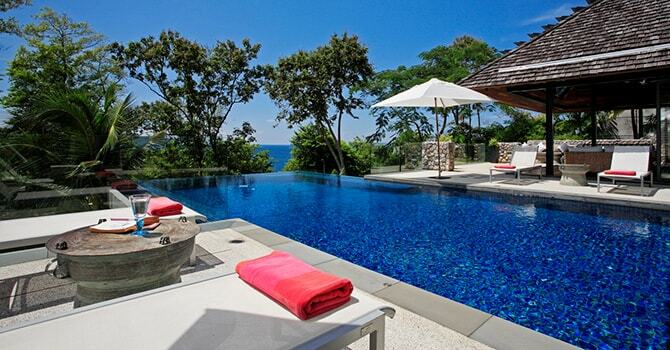 Overall, choosing a villa for your wedding presents good value for money as well as flexibility. Unlike inflexible and expensive resort packages, we can help to tailor a bespoke package to meet your expectations of a Phuket wedding cost. We understand that you want your wedding to be absolutely perfect; the ideal beginning for a long and happy life together. We’d be honoured to share in that with you. You may like to look through our selection of Phuket wedding villas which are hand-picked as some of the best and most luxurious offerings in Phuket. No matter the size of your wedding party, you’re sure to find something that is just right. We know that while planning a wedding is incredibly exciting, it can also be overwhelming. That’s why we would love to have a no-obligations discussion with you about your plans for your special day, and whether a Phuket wedding would be right for you.